How to Achieve Big PHAT Goals™ is a goal setting program designed for leaders who view their employees as an investment rather than an expense and are committed to retaining, developing and leading committed self motivated team players. 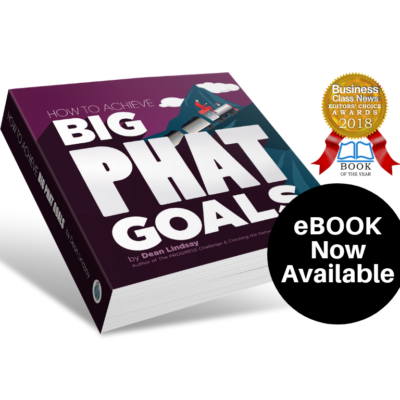 Dean Lindsay’s Big PHAT Goals goal setting program helps Align Personal Goals with Organizational Objectives and includes insight into the Six Ps of Progress and the Six Rules for Big PHAT Goal-Crafting, both found in Dean Lindsay’s newest book, Big PHAT Goals. It’s Time to Make Your Team’s Goals PHAT (Pretty, Hot And Tempting)!!! We must dedicate ourselves to crafting personal and organizational goals that are so attractive, so alluring, so PHAT that we are compelled to continually make choices that move us toward their accomplishment. As a noun, CRAFT can mean an object or machine designed for a journey, like a ship or an airplane. As a verb, CRAFT can mean to make or manufacture with skill and careful attention to detail. A goal is the aim, the objective, the purpose, the point. Stop setting goals and start CRAFTING goals. Well-crafted, progress-based goals do not merely remind us of the desired destination; they help create the conditions and environment needed for their achievement. They propel us into forward-focused action and strengthen our resolve to work and win in a world of change. Goal-crafting (goal setting) is the practice of creating personal and organizational targets that are so clear, so detailed, so sound, so enticing and leak proof that they actually become tools or vessels in our journey to their accomplishment. Our lives and organizations will surely change without well-crafted goals, but it is doubtful that they will progress. — Patrice Wheeler, Senior Employee & Organization Development Specialist, Mary Kay Inc.